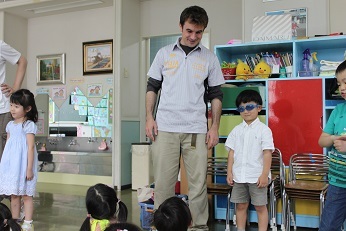 HOME ＞ CURRENT EVENTS ＞ Today’s Class 4! Today was a great day for Class 4! It was a rainy day outside, but inside it was bright and sunny! 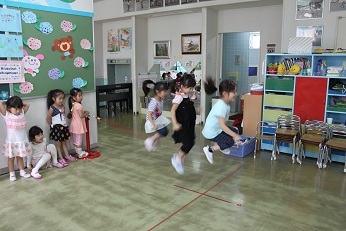 During Discovery Time we all got excited about jumping rope. Out came the jump rope stand and everyone had a try. We even had 3 kids jumping at the same time! After a fun morning meeting with Class 7, we went for our swimming lesson. Everyone was jumping and splashing about like fish. 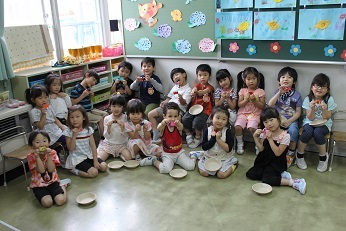 After a yummy World Lunch from Korea, we made this month’s birthday present candies for the June birthday kids. What a day!